Last week I reviewed Svetlana Alexievich’s “Zinky Boys – Soviet Voices from the Afghanistan War”, and at that time I wrote about her being favoured to win the Nobel Prize for number of years. Another writer who has prominently featured in Nobel Prize winning discussions is Ko Un from Korea, however it has taken me some time to read any of his works. A new release was time to discover his writing. Born in 1933 in Kunsan in Korea’s North Cholla Province, when Korea was under Japanese rule, forced in June 1950 to repair the bomb-damaged runways of an air-force base by the People’s Army when the Korean War broke out, he later joined a Buddhist clergy, living a life of Zen meditation, travelling the whole country and living by alms for ten years. In 1962 he resigned from the clergy, falling into deep depression, attempting suicide and heavy drinking he awoke in a hospital after a thirty hour coma from a failed suicide attempt. During this ten year period, as a nihilist spokesman, a number of publications occurred. In 1973 he rejected his reputation as a spokesman of Nihilism and began writing militant nationalist poetry. Taking a leading role in the drive against president Park Chung-Hee’s plan to amend the Constitution to allow himself a third term in office he became the first secretary-general of the Association of Writers for Practical Freedom. This led to his persecution by the Korean Central Intelligence Agency and a number of arrests and prison terms. Tortured, court martialled on the suspicion of high treason we was sentenced to a long prison term. In 1982 after lobbying by other writers he was set free by a general pardon on Liberation Day (August 15). The reason why there is night should be the stars. Beneath the starlight of the night sky I have lived the chronology of my poetry. In October 1979 I provided one of the motivations for an incident by which the most blatant dictatorship in modern Korean history had to be brought to an end. After the assassination of the dictator, I was freed from prison. However, in May the following year, with the second military coup, I abruptly became a criminal, guilty of conspiring to rebel, violating martial law, and inciting others to violate martial law, etc. The special cell in the military prison was a closed space without windows, measuring 1.5 metres by 1 metre. Given the state of emergency in force then, my very survival was most uncertain. I had already decided what my final gesture would be when the time came for me to die. Deprived of present time in that despair, the incompetent act of remembering alone served as a substitute for the present time. I began to realise that remembering and imagining something could be a source of strength, enabling me to endure day by day the darkness and the fear. 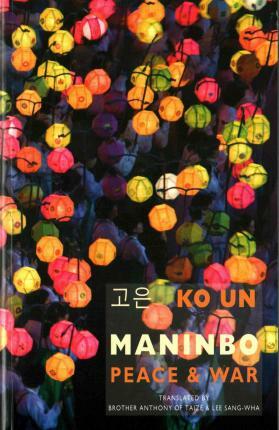 “Maninbo” was born as a “collection of songs about the people” Ko Un came to know in this world. Simply looking at his life story and Ko Un’s message that every human deserves a memory, acknowledgement, recognition, alone this noble task surely means a future Nobel Prize. This new collection of Ko Un’s works, from Bloodaxe Books, contains volumes 11-20 of the “Ten Thousand Lives” project, with the first volumes previously appearing in a US publication in 2006 (sadly now out of print), with volumes 16-20 focusing on the suffering of the Korean people during the Korean war. The books has an introduction by Ko Un, a Translator’s Preface and a summary of Korean history to assist the reader with context, a very welcome addition for this reader as it briefly covers, in seven pages, ancient times through to the present day situation. where people love to make their names known. Or maybe that’s not the reason, either. all he does is put a mark on a paper and leave. does each individual bird have a name? Why, a name is a person’s prison. A suspicious person is a spy. A traveller is a spy. at the sight of someone, anyone, all are spies. Report them. Report them and earn a reward that will change your luck. In this country today we have no more wandering travellers. In the early volumes I was searching second hand bookstores to buy more of Ko Un’s works, especially trying to source volumes 1-10, however as the Korean War section begun I had a lull, with a number of poems more fact driven and at times tedious, but the sheer volume of impacted people becomes apparent as you get a glimpse of a country torn apart by Russian, Japanese, US, UN and local forces. a gaunt mouse came along. When would the war end? Spanning Korean history we have moments of a life, a glimpse, we have whole lives from birth to death, we have the school-girl sweetheart who is raped multiple times and buried alive, a juxtaposition of beauty and horror. We have Buddhist musings, meditative contemplations on existence up against the brutality of war, imprisonment, torture. In true Buddhist style the contemplation of others is always to the fore and my reading from cover to cover is possibly not the best way to approach this monumental work, if you were to read a poem a day, contemplate the others pain and suffering and existence it would take you almost eleven years to complete the reading. she sold rice-cakes again in the People’s Republic. A remarkable collection of people’s lives, a celebration as well as a denouncement of humanity. A work that should be on every poetry reader’s shelves, a work you need to revisit time and time again, to ground yourself. Surely the Nobel Prize is forthcoming. This entry was posted in Uncategorized and tagged Korea, Poetry. Bookmark the permalink. I read the earlier volume of Ten Thousand Lives years ago and always meant to read more Ko Un – it's a wonderful book – but, well. So thanks for the reminder and the quotations, which are convincing. Well, I am only the translator but many thanks for your kind review. It should perhaps be noted that we have only translated a selection from volumes 11-20, not the whole 10 volumes! The same holds true for the earlier 10 Thousand Lives volume from Green Integer which is, you have not noticed, available from the publisher as a PDF file http://www.greeninteger.com/book-digital.cfm?-Ko-Un-Ten-Thousand-Lives-&BookID=326 Enjoy! Thank you for stopping by, it is an honour to have you read my review. Translating poetry must be s very daunting task, getting the rhythm, the meter, syncopation etc in line would be a massive ask. Many thanks for the pdf link.